This the first of two articles that describe the development of a new generation of global modelling tools that was first proposed by the authors as members of a working group of the Canadian Association for the Club of Rome in 1993. This paper describes the underlying conceptual framework adopted by the group. The companion paper describes the Global Systems Simulator that was intended to serve as proof-of-concept for the proposed modelling tools and the experience in using those tools that has accumulated to date. What follows, then, is original paper as it appeared in the Proceedings of the Canadian Association for the Club of Rome, Series 1, Number 7, September 1993. Footnotes have been added to enhance and qualify the text to reflect new learnings. It is now twenty years since the issues associated with the global 'problematique' were widely publicized in Limits to Growth, the pioneering study commissioned by the Club of Rome. In the meantime much has been written, but real action that might lead to a more harmonious and sustainable future has not been forthcoming. Indeed there is evidence that these issues are becoming even more threatening to humankind. There is an apparent inability of human societies to address the global problems of sustainability identified by the Club of Rome twenty years ago. This paper advocates the use of global modelling tools as a means of expanding our collective capacity for perception. What is proposed is not the development of another model but the establishment of a process consisting of the design and use of modelling tools to further the explication and communication of understanding, and thereby facilitating both individual and societal action. The proposed approach builds upon the strength of World Dynamics Model as a communications device and seeks to take advantage of scientific and technological advances of the past decades. It is now twenty years since the issues associated with the global 'problematique' were widely publicized in Limits to Growth, the pioneering study commissioned by the Club of Rome. Since then, much has been written on the subject, including the United Nations report of World Commission on Environment and Development, Our Common Future, [WCED, 1987], the publications of the World Watch Institute, and more recently a Report by the Council of the Club of Rome, The First Global Revolution [King, 1992] [†]. As well, the authors of Limits to Growth updated and reiterated the original findings in Beyond the Limits [Meadows, 1992][‡]. Innumerable conferences on 'sustainable development' have been held, including, most recently, the UNCED conference in Rio de Janeiro. But real action that might lead to a more harmonious and sustainable future has not been forthcoming. [§] Indeed there is evidence that these issues are becoming even more difficult to deal with and more threatening to humankind. There is an apparent inability of human societies to address the global problems of sustainability identified by the Club of Rome twenty years ago. The understanding, which is in fact a model of the system—a systems model, plays a pivotal role in the decision process. It serves to identify the set of state variables or indicators to be observed or monitored and relates the observed state variables to the objective, in this way providing feedback to the decision making process. The systems model also supports the choice of objectives by facilitating the definition and exploration of alternatives. In this context, it is worth recalling the cybernetic theorem, the Law of Requisite Variety, which states that the regulation that the regulator can achieve is only as good as the model of the reality that it contains [Ashby, 1956]. The systems models associated with the decision processes which give rise to individual actions are seldom explicit, nor is the individual even conscious of their existence [Maturana and Varella, 1980, Senge, 1992, Erlich and Ornstein, 1989]. In the application of this framework to the issues of the global problematique, a number of problems become apparent. If we accept the concept of sustainability as the 'objective', three complicating features arise. First, sustainability is a comprehensive concept; it is a property that applies to a system as whole. Just as 'temperature' and 'pressure' are properties that apply to a gas, not to the individual molecules that constitute the gas, sustainability is a property of the global ecosystem, not its constituent processes. Second, sustainability has a clear reference to the future as it is concerned with the persistence of harmonious relationships between human activities and the environment indefinitely into the future. Third, the sustainability of human populations is an objective that is potentially in conflict with the objectives of individuals. In the case of global problems, the 'manager' or controller is society itself: individuals and the institutions of society that have been delegated responsibility for managing various aspects of human activities. Since this 'manager' system is obviously not monolithic, effective action will depend upon managers having a common understanding or shared systems model. The understanding of the system is (i) incomplete to the extent that specific processes are not understood and (ii) fragmented in that partial systems models exist in narrowly defined disciplines. These various systems models are uncoordinated with the consequence that understanding of the system as a whole is impeded. In the absence of widely shared understanding or common systems model, the feedback loop from observations of the system to the system manager is weak. The property of sustainability cannot be directly observed or monitored because it is a property that applies to the future of the system and the future of the system is not fully determined or indicated by its present state. 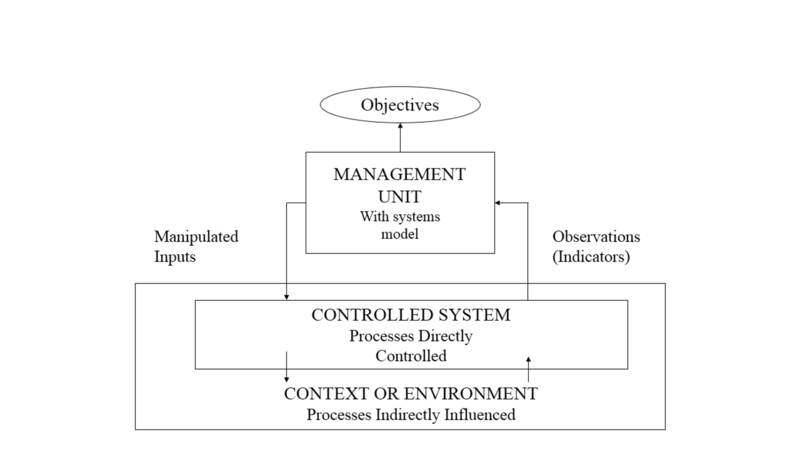 From the discussion above, it is clear that a conscious and explicit systems model plays a crucial role in developing and communicating a common understanding needed for effective interpretation of the observations and for both individual and collective action. It is equally clear that the written word has failed to develop this common understanding. Much of the writing on the subject of the 'problematique' takes the form of expert analysis followed by prescription, a form that combines elements of verbal description and persuasion. Verbal description, relying on the linear subject/predicate cause/effect constructs of language, has not proven to be effective in describing a causal and complex systems; persuasion, relying on rhetorical technique and selective arguments, may trigger action, but seldom conveys understanding. Prescriptions made by 'experts' are increasingly suspected by a vast majority of people who believe they are not capable of understanding but have learned through experience not to trust such pronouncements. Argument, according to Northrop Frye, relies on the arrangement of data. Arrangement means selecting for emphasis, and selecting for emphasis can never be definitively right or wrong [Frye, 1990]. The scientific method, relying as it does on controlled and repeatable experiments, does offer a powerful means of communicating understanding. But the scientific method is reductionist and by itself is inappropriate for holistic analysis of evolutionary systems (of which humanity is an integral part) which are structures fixed in space and time. These systems are subject to constant and irreversible change. We believe that the success of the World Dynamics project may be attributed to its ability to communicate an understanding of a complex and dynamic system through the description of the structure of a mathematical systems model [Forrester, 1971]. This experience suggests that a computer based simulation model that can be used to explore the future consequences of societal actions may be an effective means to communicate the understanding needed for effective societal action. If the present growth trends in population, industrialization, pollution, food production, and resource depletion continue unchanged, the limits to growth on this planet will be reached sometime within the next 100 years. The most probable result will be a sudden and uncontrollable decline in both population and industrial capacity. It is possible to alter these growth trends and to establish a condition of ecological and economic stability that is sustainable far into the future. The state of global equilibrium could be designed so that the basic material needs of each person on earth are satisfied and each person has an equal opportunity to realize his or her individual human potential. If the world's people decide to strive for this second outcome rather than the first, the sooner they begin working to attain it, the greater will be their chances of success. Limits to Growth served to identify the two most dominant elements of what came to be known as the world problematique, a term associated with the Club of Rome, namely the population explosion and the macro impacts of human activities on the environment. Limits to Growth is remarkable for its success: some 10 million copies in thirty languages have been sold worldwide; it stimulated debate, generated the controversy that gave recognition to the Club of Rome, and brought about an increased awareness of the interactions that take place among the elements of the problematique. Yet in the final analysis, Limits to Growth failed to stimulate the action that might lead to a more harmonious and sustainable future. Why? It may be that the inevitability of the overshoot and collapse predicted by the World Dynamics model led implicitly to the conclusion that nothing could be done with the consequence that nothing was done. However, the inevitability of the overshoot and collapse predicted by the model may be as much an artifact of both the paradigm to which the model belongs and the structure of the model as it is an accurate reflection of how human societies interact with global systems. The World Dynamics Model belongs to the deterministic natural science paradigm in that it represents a closed system and presumes that the future of the system is predictable to the extent that the model captures the laws of motion of the system. It makes the user of the model an observer of a (closed) system rather than an integral part of an open system. The deterministic character of the World Model, by its nature, excluded the possibility that human societies can learn and adapt. The relationships of the model represent both the dynamics of the interactions among physical transformation processes and the behavioral responses. The Model does not have a direct representation of 'process'; rather it represents stocks and the factors that influence the rate of change of stocks. The system of feedbacks, both positive and negative, is complete. Human response, one of the factors that may influence the rates of change of stocks, is triggered by the levels or rates of change of stocks. The model structure is such that human decisions are based only on what has happened; it does not represent the fact that human decisions are based on expectations of what will happen. Furthermore, expectations of what will happen are subject to change as humans gain a greater understanding of the world. For these reasons the natural science paradigm[††] is inappropriate in circumstances where social actors are viewed as the essential forces that structure and restructure social systems [Burns, 1985]. limited and it is the renewable resource base and the rate at which solar energy is used to fuel the biological process of photosynthesis that will determine the sustainability of human populations. What is needed is a new approach that builds on the strengths of the World Dynamics Model and its successors and that emphasizes the process of designing and using computer based global modelling tools as a means for developing the common base of understanding needed for effective societal action. Such an approach is feasible because of advances in our understanding of ecological systems, the emergence of an evolutionary paradigm to augment the deterministic natural science paradigm, and a revolution in computer technology. From this it is evident that models intended to predict or prescribe are of little interest. Rather what is required is a set of tools for exploring the 'ensemble of possibilities' of the evolutionary paradigm. The need is not for a 'better' model that might be developed within the confines of a small group to further the advocacy power of that group; rather it is to use the process of designing and applying global modelling tools to facilitate the communication of understanding within as broad a group of actors as possible. The word 'tool' is used deliberately, as a tool is an extension of the user of the tool. The use of well-designed tools enhances the ability of the user to accomplish explicit tasks. A shovel facilitates the task of digging a hole and extends mechanical capabilities; a ruler makes more accurate the recording of the property of length of objects; a telescope enables visual perception of objects that could otherwise not be seen. Knowledge of the availability of tools suggests tasks or objectives that would not otherwise have been considered. The global exploration tools herein proposed are intended to enhance the ability of individuals and societies to understand the longer term implications of societal actions and to explore alternative global futures. With this background, we conclude that there is both need and potential for the development of a generation of global modelling tools that can serve to facilitate and communicate a more appropriate model of reality such that human society can perceive the full consequences of actions. Such modelling tools can take advantage of both theoretical and scientific advances and advances in computer technology. What follows is an outline of the features and characteristics of such global modelling tools and a discussion of the strategies for the organization of their development. The User/Society as an Integral Part of the System The systems model consists of two components: an open simulation framework that represents the processes of the system to be managed with their context and the user/society that is the source of novelty or learning. Through interaction with the framework, the user/society explores the implications of decisions and changes in the environment. Exploration is a learning process that enables the user/society to increase his understanding of the system. In this way learning from experience can be incorporated into the framework. Stocks and Flows Another taxonomic and conceptual problem that has plagued economics from the time of Adam Smith is the confusion between stocks and flows . . . The capital stock is a population of items, production is births into that population, consumption is deaths . . . Furthermore, the idea that production is consumption is only partly true. What we get satisfaction from for the most part is use, not consumption . . . This has led to . . . the absurd view that it is income which is the only measure of riches. [Boulding, 1978]. The simulation framework should keep track of the evolution of stocks of human population, the stocks of artifacts constructed by those populations for their use, stocks of land, stocks biological resources, and stocks of geological resources, and it should keep track of the flows of materials and energy from the environment as they are transformed into the artifacts used by human populations and returned to the environment as material and thermal waste. Stock/flow accounting identities are used to maintain coherence over time; supply/disposition flow identities are used to maintain coherence within time periods. Spatial Scale The spatial scale of the simulation framework should of course be global, but the world should be subdivided into a sufficient number of regions to reflect differences in culture, lifestyle, resource endowments, and power. The framework should represent the flows of people, materials and energy that cross the regional boundaries. The number of regions to be represented will also depend on the nature of the processes to be included. The simulation framework will be designed so that more detailed representations involving more regions could readily be developed as the framework evolves. Temporal Scale The temporal scale of the simulation framework should span a sufficient past that we can see where we are coming from and a sufficient future that the possibilities for sustainability can be explored. The accumulation of past actions to the stocks that presently exist must provide the starting point for future explorations; in this sense, future possibilities are constrained by past actions. Trying to sharpen one's sense of the future is useless, as the future has no existence; trying to see the present as an interim in which anything may go at any time merely adds to the mood of destruction. Not everything that can happen will happen: we have to understand what kind of people we are before we can begin to guess what we shall do. What kind of people we are is perhaps determined, and certainly conditioned, by what we realize of the past, and sharpening our sense of the past is the only way of meeting the future. [Frye, 1982] Different processes have different time dynamics; very slow moving processes such geological processes may be ignored or represented as stocks; fast moving processes may exhibit seasonal or cyclical patterns and are represented as stock/flow structures. Structure The simulation framework should focus on the representation of those physical transformation processes that are of significance for the relationships between human population and the natural resource base. Of great importance are processes associated with the renewable resource base; processes affecting soil quality, forest growth, processes yielding nutrients, processes transforming primary sources of renewable energy into useful energy forms. In the final analysis, the level of human population that can be sustained will be determined by renewable resources and the effectiveness with which they can be used to provide nutrition and energy for extracting and recycling materials. Adaptability Since it is difficult to foresee all the structures and transformation processes that need be represented, the simulation framework must be open ended with respect to the addition of processes. Each process or group of processes can be independently modeled; these sub-models can be linked together to form the simulation framework. This module management process should support the creation and modification of sub-models as well as the linking of these new or changed sub-models in a manner as flexible and transparent as possible. A key feature of the proposed approach is that the understanding arises from interaction with the framework in the process of exploration. The communication of understanding is achieved when a number of people share the experience of interaction. If common understanding is to lead to improved societal decision-making, the correspondence between the framework and reality must be accepted both in terms of the processes that constitute the framework and the representation of those processes. The acceptability and impact of the proposed decision tools will be greatly enhanced through involvement of as wide and as diverse a set of interests as possible in the process of designing the structure of the framework. This key assumption reflects extensive experience with complex decision systems involving diverse and competing interests. The primary task will be conceptualization and construction of sub-models. This task will require people with expertise in modelling, theoretical knowledge of the sub-model issues and relevant field experience. Many of these will be potential users of the Global Exploration Tools. University groups or research institutes are best equipped to take the lead in the conceptualization and associated data collection and calibration tasks. A key requirement in the management of sub-projects would be to ensure the ongoing participation of organizations with interest and experience in the subject areas concerned. Since the proposed Global Exploration Tools have the capability of "learning", their utility will increase through use. Thus, users will become collaborators in future development of the framework. Mechanisms for feedback and up-date of the framework will thus need to be developed. At each stage in the development process, it is important to consider potential users of future generations of the framework and seek their involvement. Conceptually, the Project could be viewed as a knowledge system in which knowledge development is integrally linked with knowledge application within a structure which encourages feed-back through rewards of utility. Identification of knowledge networks and involvement of key players in such networks becomes an important component of development strategy. The authors are aware that this paper is itself an example of an argument intended to persuade the reader, and, as such, is subject to the weaknesses implied by Frye's criticism. In the spirit of learning through experience, we invite the reader to explore the concepts described in this paper using a computer based simulation framework, the Global Systems Simulator(GSS), developed by Robert Hoffman and Bert McInnis. The companion paper describes the Global Systems Simulator that was intended to serve as proof-of-concept for the proposed modelling tools and the experience in using those tools that has accumulated to date. Ashby, W. Ross. (1960) Design for a Brain. New York: Wiley. Bariloche Group. (1976) "The Latin American World Model" Proceedings of the Second IIASA Conference on Global Modelling. (Ed. Gerhart Bruckmann) IIASA, 1976. Barney, Gerald O. (1982) The Global 2000 Report to the President. U. S. Government Printing Office. Bateson, Gregory. (1972) Steps to an Ecology of Mind. New York : Ballantine paperback. Bateson, Gregory. (1980). Mind and Nature: A Necessary Unity. New York: Bantam Books. Beer, Stafford. (1973). Designing Freedom. Toronto: CBC Massey Lectures. Beer, Stafford. (1979) The Heart of Enterprise. London: John Wiley, London. Beer, Stafford. (1981) I Said, You are Gods. The Third Annual Teilhard Lecture. London: The Teilhard Centre for the Future of Man. Boulding, Kenneth. (1978). Ecodynamics: A New Theory of Societal Evolution. London : Sage Publications. Boulding, Kenneth E. (1988). "Can There be Models of Sustainable Development?" in Alex Davidson and Michael Dence, (eds) The Brundtland Challenge and The Cost of Inaction. The Institute for Research on Public Policy and the Royal Society of Canada. Burns, Tom R., Thomas Baumgartner, and Phillipe DeVille. (1985) Man, Decisions, Society: The Theory of Actor-System Dynamics for Social Scientists. New York: Gordon and Breach Science Publishers. Campbell, Jeremy. (1982). Grammatical Man: Information, Entropy, Language and Life. New York: Simon and Schuster. Capra, Fritjof. (1982). The Turning Point. New York: Simon & Schuster. Capra, Fritjof, (1985). "Criteria of Systems Thinking", Futures, Volume 17, Issue 5, October, 1985. Checkland, Peter. (1981). Systems Thinking, Systems Practice. London: John Wiley and Sons. Cole, H. S. P. et al. (1973). Models of Doom, London: Universe Books. Daly, Herman E. and John B. Cobb Jr. (1989). For the Common Good. Boston MA: Beacon Press. Ehrlich, Paul and Anne Ehrlich. (1991). The Population Explosion. Touchstone books. Ehrlich, P. and Ornstein, R. (1989). New World New Mind: Moving Toward Conscious Evolution. New York: Simon and Schuster Inc.
Findeisen, W., Bailey, F., Brdys, M., Malinowski, K., Tatjewski, P., and Wozniak, A. (1980). Control and Coordination in Hierarchical Systems. Toronto: John Wiley and Sons. Forrester, Jay. (1971) World Dynamics. Wright-Allen Press. Frye, Northrop. (1982) Divisions on a Ground. Toronto: Anansi Press. Frye, Northrop. (1990) Words with Power: Being a Second Study of "the Bible and Literature". New York: Harcourt Brace Janovitch, Publishers. Gault, F.D., K.E. Hamilton, R.B. Hoffman, and B.C. McInnis. (1987). "The Design Approach to Socio-Economic Modelling", Futures, 19 (1), 3-25. Gleick, James. (1987). Chaos Theory: Making a New Science. New York: Viking. Georgescu-Roegan, Nicholas. (1971) The Entropy Law and the Economic Process. Cambridge Mass : Harvard University Press. Herrera, Amilcar et al. (1976) Catastrophe or New Society. International Development Research Centre. Hirsh, Fred. (1976) Social Limits to Growth. Cambridge, MA: Harvard University Press. Kaya, Yoichi et al. (1977). Future of Global Interdependence. Report presented at the Fifth IIASA Global Modelling Conference, 1977. King, Alexander and Bertrand Schneider. (, 1991) The First Global Revolution: a Report by the Council of the Club of Rome. New York: Pantheon Books. Kuhn, Thomas S. (1970). The Structure of Scientific Revolutions. Chicago: The University of Chicago Press, 1962, Second Edition, enlarged, 1970. Laszlo, Ervin. (1987) Evolution, The Grand Synthesis. Boston: Shambhala Publications Inc.
Leontief, Wassily et al. (1977) The Future of the World Economy. Oxford University Press, 1977. Linnemann, Hans et al. (1979) MOIRA - Models of International Relations in Agriculture. North Holland Publishing Company. Maturana, Humberto R. and Francisco J. Varella (1987). The Tree of Knowledge: The Biological Roots of Human Understanding. Boston MA: New Science Library, Shambhala. Maturana, Humberto R. and Francisco J. Varella. (1980) Autopoiesis and Cognition. Dordrecht, Holland: D Reidel Publishing Company. Meadows, Donella H., Dennis L. Meadows, J. Randers, and W. W. Behrens. (1972) The Limits to Growth. New York: Universe Books. Meadows, Dennis L. (1974) Dynamics of Growth in a Finite World. Wright-Allen Press. Meadows, Donella and J. M. Robinson. (1985) The Electronic Oracle: Computer Models and Social Decisions. New York: John Wiley and Sons. Meadows, Donella, Gerhart Bruckmann and John. Robinson. (1982) Groping in the Dark: The First Decade of Global Modelling. New York: John Wiley and Sons. Meadows, Donella, Dennis L. Meadows, Jorgen Randers. (1992) Beyond the Limits. McClelland and Stewart. Mesarovic, Mihajlo et al. Theory of Hierarchical Multilevel Systems. Academic Press, 1970. Peat, F. David (1987). Synchronicity: The Bridge Between Matter and Mind. Toronto: Bantam Books. Peat, F. David (1991). The Philosopher's Stone: Chaos, Synchronicity, and the Hidden Order of the World. Toronto: Bantam Books..
Perrings, Charles. (1986) "Conservation of Mass and Instability in a Dynamic Environment-Economy System", Journal of Environmental Economics and Management 13 199-211. Prigogine, Ilya and Isabelle Stengers. (1984) Order Out of Chaos: Man's New Dialogue with Nature. Toronto: Bantam Books. Roberts, Peter et al. (1977) SARUM 76 - Global Modelling Project, Research Report N0. 19, U. K. Department of Environment and Transport, 1977. Saul, John Ralston. (1992) Voltaire's Bastards: The Dictatorship of Reason in the West. New York: Viking. Schragge, Michael. (1990) Shared Minds: The New Technologies of Collaboration. New York : Random House. Schwartz, Peter. (1991). The Art of the Long View. New York: Doubleday. Senge, Peter. (1993) "A Crisis of Perception" in The Systems Thinker, Vol. 3, No. 10, December 1992-January 1993. Cambridge MA : Pegasus Communication,. Simon, Julian and Herman Kahn. (1984) The Resourceful Earth. Oxford: Basil Blackwood Ltd.
Weiner, N. (1961). Cybernetics. New York: Wiley. World Commission on Environment and Development. (1987) Our Common Future. New York: United Nations. Meadows, Donella, Dennis L. Meadows, Jorgen Randers. (2004) Limits to Growth: The 30 Year Update. Chelsea Green. Turner, G.M.(2008). “A comparison of “The Limits to Growth” with 30 years of reality”. Global Environmental Change 18/3: 397– 411. Turner, G.M. (2012) “On the Cusp of Global Collapse? Updated Comparison of The Limits to Growth with Historical Data”. GAIA 21/2 (2012): 116 – 124. Veblen, Thorstein. (1898). "Why is Economics Not an Evolutionary Science?". The Quarterly Journal of Economics Volume 12, 1898. [*] This paper was prepared as an activity of the Global Modelling Project of the Canadian Association for the Club of Rome. Project Team members contributing to this paper are Paul Baack, Ian Nalder, Bob Fletcher, Stan Isbrandt, Ed Napke, Allan Jones, Art Hunter, and Max McConnell. [†] See Randers (2012) for an account of the challenges confronting humankind to 2052. [‡] The thirty year update was published in 2004. See Meadows (2004). Co-founder and Vice President whatIf? Technologies Inc.